In 2008, three mates traded careers in big beer for a move to the tranquility and beauty of Byron Bay. Their plan was to start a new brewery from the ground up and they had in their armoury a recipe for a beer they called Draught Ale, designed to be served fresh on tap within close range of the brewery. This was a beer made in Byron to be enjoyed in Byron. But it proved so popular it simply couldn’t be contained – as soon as a few kegs were sent further afield to test the waters, there was no turning back. 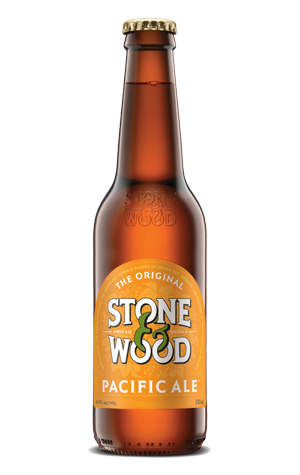 Renamed Pacific Ale in 2010, Stone & Wood’s flagship beer has become a stone cold classic, using all Aussie malts and the Australian Galaxy hop from start to finish to create a refreshing quaffer with few equals. Awash with passionfruit, citrus and tropical fruit aromas and flavours, with just a hint of bitterness, it's a cloudy, unfiltered joy of a beer that inevitably features at the pointy end of both critic and people’s choice polls in any annual list of the best Australian beers. Along the way, it's helped inspire countless copycats, creating a new variant on the "Australian pale ale" theme and has even been at the centre of a years long trademark battle in the courts, one that presumably had something to do with the decision in 2018 to rebrand it as The Original Pacific Ale. But, more than anything, it's fair to say the Australian beer industry wouldn't look like it does if Brad, Jamie and Ross hadn't come up with it.